Anyone who has travelled by public transport in the Western world over the past two years will have encountered hordes of people glued to Gillian Flynn's novel - it has been ubiquitous. So when David Fincher directs a film based on the book with Flynn writing the screenplay it is reasonable to expect big things. I hadn't read the book so wasn't too clear on what to expect. This is post-modern literature. It would be difficult to imagine this set in another time period where the plot and subject matter would make sense. Those who have read some of my past reviews will know that I struggle with stories predicated on relational deceit and deception. I struggled with this film - it was gone 2:00 am when I finally got to sleep! This is a deeply cynical and disturbing film with far more violence in it than this morning's bloodfest Fury. It challenges the viewer to decide which way is up and to know precisely what their moral compass is aligned to. This film offers a view of marriage. A unique and hopefully cautionary view of marriage where prenuptial agreements do the only thing they can - undermine trust and commitment. Is Nick (Ben Affleck) really any different to most ordinary guys? I guess not. Is Amy (Rosamund Pike) really any different to any New York girl? YES - Amazing Amy was a child prodigy who was cajoled and manipulated by her smarmy parents whose immense intellect failed to note that in her development and stardom she was losing touch with the ability to relate to people in a way that evidenced vulnerability and empathy. Nick's chase of Amy at a party shows the wit and repartee of the couple as they joust to win acceptance from the other. Clearly both are very good-looking and attraction at that level is plain to see, but Nick's quest to win this physical and intellectual beauty is forced by Amy to continue on and on and into their marriage. Which is when they begin to encounter problems. So is this a film about marriage and relationships or is it a film about a spoilt child prodigy who cannot exchange an over-endowment of grey cells for common sense and compassion? Maybe this is a very male reading of the story. Perhaps that is Flynn's genius playing out - presenting to men Nick seduced by New York chic who seems to be the victim, whilst at the same time presenting to women Amy as a wife whose potential and fulfilment becomes limited by a husband with only modest small-town Missouri ambitions. I won't go into the story or plot so as not to spoil it for anyone who has yet to encounter it. The concept of the story is remarkably clever and the way in which the film is edited greatly heightens the dramatic effect. It is a masterful whodunnit. 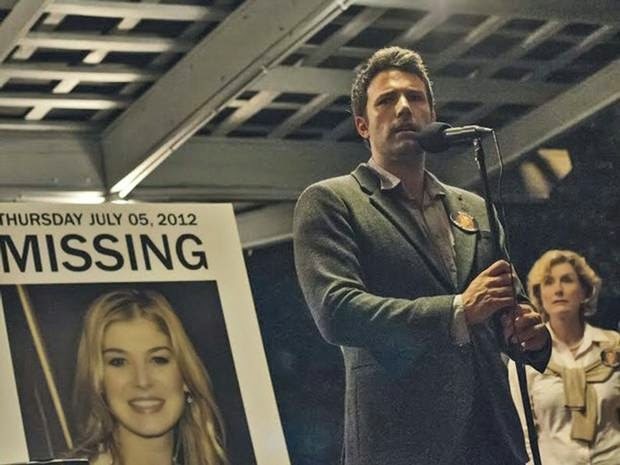 Affleck gives an extremely convincing performance as does Pike. I first encountered Pike as Miranda Frost in Die Another Day (2002) - another nasty piece of work. I'm sure she's lovely in real life and any dislike of her on my part is wholly down to her excellent acting abilities. There are some faults with the story - particularly its pacing which after a slow third quarter sprints at hyper-velocity to a less than convincing conclusion. It is clear that some characters in the film don't buy the explanations of what happened but are seemingly unwilling or unable to explore where their intuition points them. However, if you want to see a film that captures the Zeitgeist of contemporary relationship conundrums and causes you to scratch your head as you try to work out exactly what has happened, then this is for you. Of its type this is one of the best - even with its shortcomings. I'll give it 8/10. Some exciting looking films around at the moment!